The Retrospect Management Console supports mass deployment of scripts through its Shared Scripts workflow. 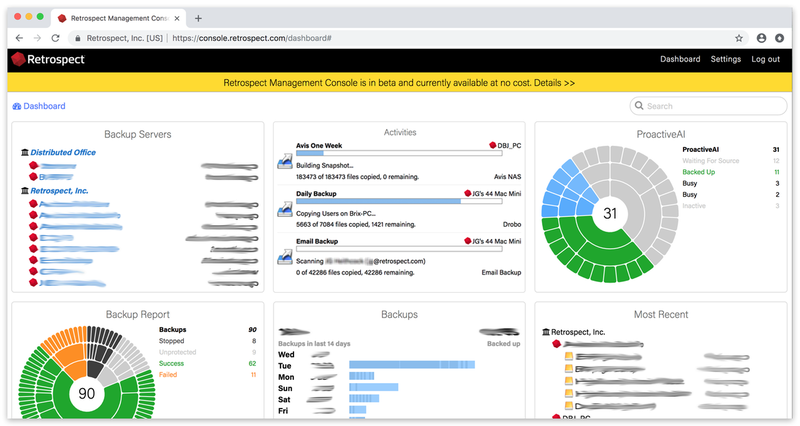 With Shared Scripts, IT administrators or partners can update a set of Retrospect Backup 16 engines with a common ProactiveAI script to a single cloud destination. See the following step-by-step guide. Log into your Retrospect Management Console account and click on "Settings" to access your account at the top right of the screen. Click on "Scripts". You will see a list of Shared Scripts with a summary of each, including deployments. Click on "New Shared Script". You will be able to select which source containers you want to include, which cloud destination, and the schedule. For the "Destination", you can select between Amazon S3 compatible providers and B2. 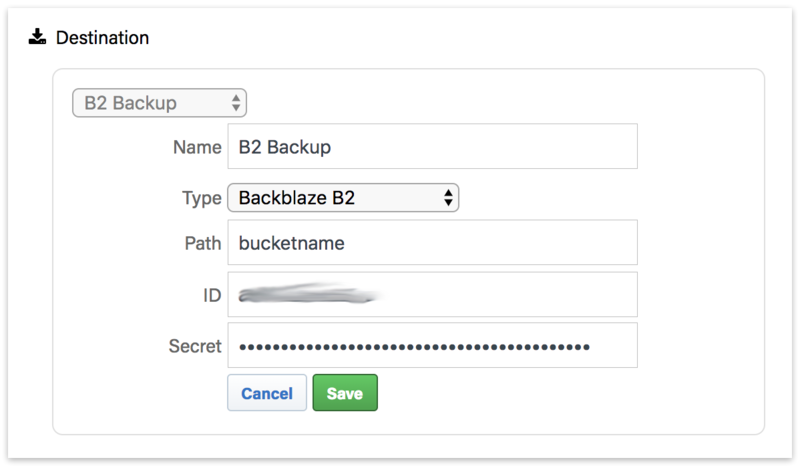 For a B2 cloud destination, enter the bucket name. For an Amazon S3 compatible provider, use the entire URL with bucket name. After you save the script, select that script's deployment options. Select the engines that you would like to deploy this Shared Script to and click "Save". The script will then be deployed to those engines. All Shared Scripts are use AES-256 encryption. You will find the encryption key in the "Deployments" tab under "Security Code". Each backup set will be named 'Destination Name-Engine Name' to ensure the separate Storage Groups do not use the same destination path. 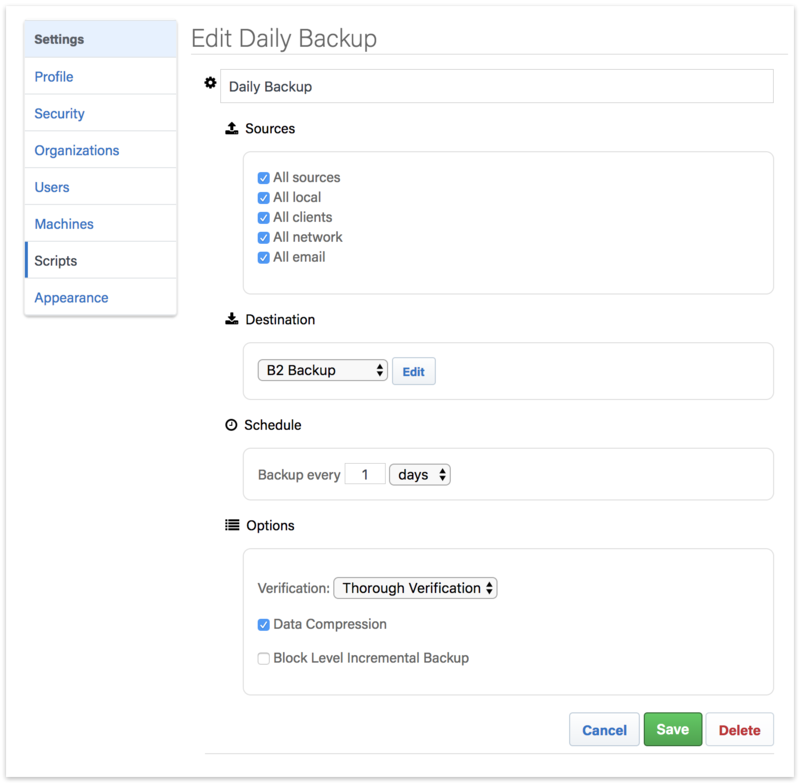 Retrospect Backup engines contact the Retrospect Management Console every 60 seconds to provide real-time status updates and fetch any management instructions. The Retrospect Management Console does not initiate or maintain an active connection to the engines. Note that as of March 5, 2019, deployment options are limited to ProactiveAI scripts with standard source containers ("All sources", "All local", "All clients", "All network", "All email") to cloud destinations with simple scheduling options. Support for local sources, local destinations including disk, scheduled scripts, and more extensive scheduling options will be available soon. Using the same license on multiple engines will have unexpected consequences on Retrospect Management Console, including data switching back and forth between machines and deploying scripts to both machines. 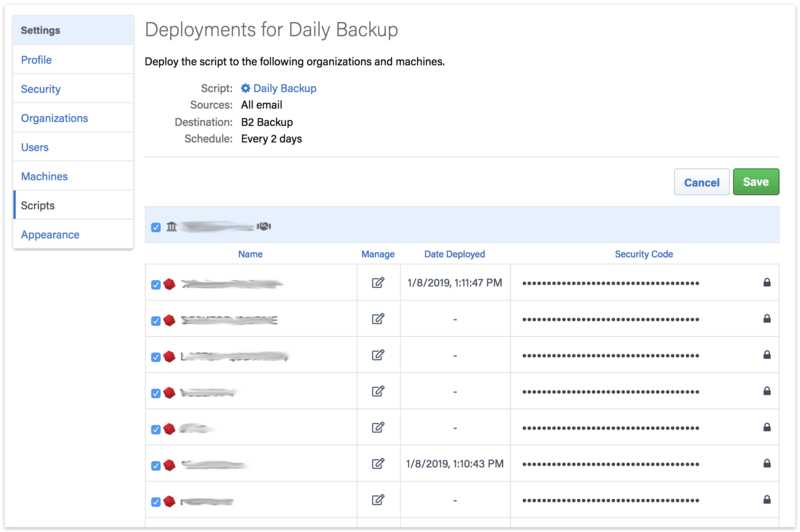 Once you deploy a script to a machine using a cloud destination, you cannot change the name of the backup server, as it is used as part of the path in the cloud destination.